Ever notice that all your exams just happen to fall back to back (to back)? What about always having all of your finals in the latter half of finals week? Whats the point of dedicating a whole week for finals when they all end up falling on the last day? Anybody gotta bad finals week schedule? If you’ve got an easy finals week, feel free to make fun of those less fortunate. I don’t have mine for 6 more weeks and they are one a day MTW and the 4th one is a take home. Nyah! My final schedule May 9th: American Lit 10:00am-11:50am and May 10th: Environmental 8:00am-9:50am, Cell Biology 10:00am-11:50am, and Psychology 1:00pm-2:50pm. Oh did I mention all of them are comprehensive finals too! 3 in one day? I would cry. Hard. I cried just thinking about it. My schedule consists of ALL my final assignments due on May 2nd, and three finals next week Monday, Tuesday, and Thursday. I originally had two on Monday, but I got out of one final for doing a presentation instead. Btw, is this your handwriting when you draw the comic or do you use a font? Nope, it’s all hand drawn/written. Sometimes I copy the name/address line over from older comics. Your handwriting is neat for a guy. Music Appreciation final: Listen to music, nod head to music, get an A.
Dressing, Singing AND Acting Final? Must of been comprehensive. I’m so glad we have self-scheduled exams here. I take one exam a day, with a day off in the middle if i have few enough. Where is this? I might transfer. All of my finals were the week before finals week for me… 15 hours of sleep covered the whole week. And that’s an ish number….Hooray for the art department!!! Im pleased with the high number of artists that read/comment on my webcomic. It gives me the impression that I might actually be doing something right. 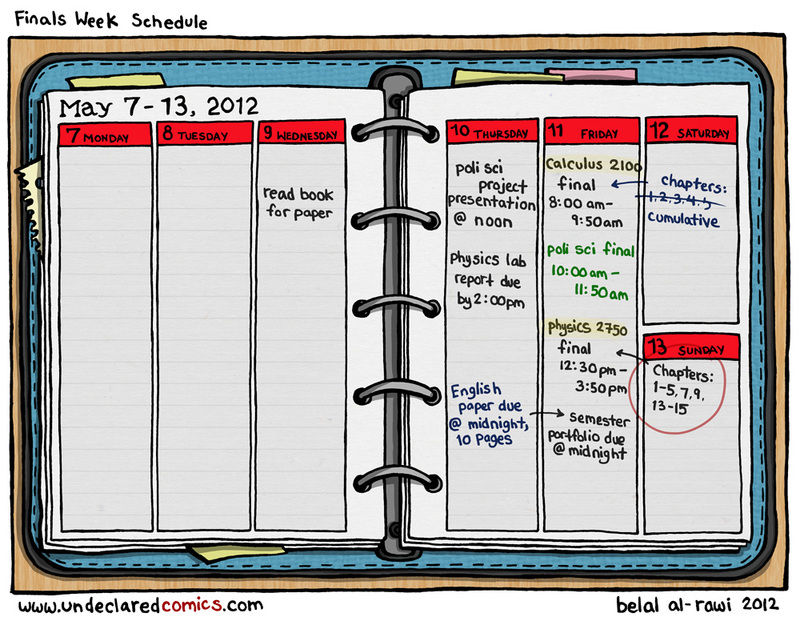 I have one final each day except for Wednesday :). Organic Chem is on Monday… someone kill me now! I hear bad things about Organic Chem. Yeah, come on, cant a guy get a break. O M G!! so true!!! that’s my schedule for sure!! I love movie time. This summer, I play on watching every episode of Seinfeld. My ONLY final is the final day of finals week, (Friday) at 8 a.m. None of my other classes have finals. So this is a massive pain. Thats extra time to study… wait. Why do that when you can just put it off til Thursday night. After my finals I’m going to Cancun and I cannot be more excited! Today was my last final of my last year of college! I’ve got a real job waiting for me now and two Bachelors degrees that will be in the mail in the near future! International Studies and Psychology. In a few months I’ll be going to South Korea to teach English. In the meantime, I’ll be writing insurance claims. Pretty strange, but the second one is a job and the first will be an awesome experience. Working internationally is a great experience – Its like a paid vacation. South Korea sounds awesome! Congrats bud. At my school we get to pick our finals schedule. Certain exams are offered during so many periods (there are 3 a day) and you can schedule up to 2 finals a day, but not a night and morning final back to back. I have a Monday morning (electrical engineering) and afternoon (human geography) and a Tuesday afternoon (stats). Wow, I’m surprised your school doesn’t have a policy where you can only have the maximum of two finals falling on the same day. My school has that, but because of that it extends finals week to really be a week and a half. Not like I study anyways.